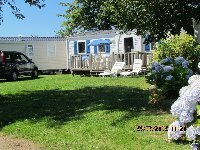 HOLIDAY HOMES TO RENT IN FINISTERE, BRITTANY. 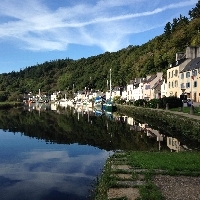 Welcome to our selection of holiday homes to rent in Finistere, France. Located at the most westerly point on the French mainland, the departement of Finistere in Brittany is a beach lover's paradise. With nearly 800 kilometres of coastline, there are beaches to suit everyone's taste, from the sheltered sands and ports on the south coast to the more exposed and spectacular cliffs and headlands that face the full force of the Atlantic Ocean and have done for centuries. Some of the scenery on the west coast of Finistere is truly breathtaking, shaped by thousands of years of erosion. The Crozon peninsula, just south of the main town of Brest, has a jagged rocky coastline, with steep cliffs and few beaches that are suitable for sunbathing. If you prefer exploring on your holidays to relaxing with a book in the sun, then this is the area of Brittany for you. There are several interesting geological features in this area, including the Penhir headland with its three standing stones and the Chevre Cape which has several footpaths running right along the edge of the cliffs. Follow the coast round to the south and you come to the Raz headland which towers over 70 metres above the sea below and is a very popular day trip with tourists in Brittany. On the southern coast of Finistere, you will find more sheltered bays and coves where sunbathing and swimming is more popular. This is also where you will find the traditional Breton fishing ports, many of which have not changed for decades. Concarneau is one of the best known, thanks not just to its old port area, but also the walled town and Breton fishing museum outlining the history of this important industry. The tiny villages of Kerascoet and Kercanic have become popular with tourists too, thanks to their stone cottages with thatched roofs that look like something out of an English country village. The main coastal town in Finistere is Brest, which has a medieval old town and historic port as well as family entertainment and attractions, such as Oceanopolis, a giant aquarium, museum and interactive centre which aims to teach visitors about oceans all over the world. Inland, the region's capital is another medieval town, Quimper. The pretty pedestrianised streets, many bridges spanning the two rivers that flow through the centre and open squares with pavement cafes and half-timbered houses have made Quimper one of the most-visited towns in Brittany. There is an annual cultural festival in the town which celebrates Breton music, traditions and even food. Looking for self catering holiday accommodation in Finistere? Then below is a selection of gites in Finistere and villas in Finistere that can be rented direct from their owners. You can either click on each listing for further details or you can use our search engine on the left if you are looking for something in particular.